Upon the invitation of Mr Jorgen Gammelgaard , Danish Counter– Terrorism Coordinator and Chair of the (COTER) Ambassador. Francisco Caetano Madeira, Special Representative of the Chairperson of the AU Commission for Counter– Terrorism Cooperation, and Director of the ACSRT visited the House of the European Union in Brussels, had a working lunch with Mr. Gilles de KEROCHOVE, EU Counter-terrorism Coordinator and addressed the participants of the COTER meeting. the following is the summary of his statement . Ambassador Madeira thanked the meeting for giving him this opportunity to share experiences and analysis on terrorism with the participants. He briefed the meeting on the situation in the African continent over the past six months, saying that East Africa experienced significant terrorist activities carried out mainly by Alshabaab. In this regard he pointed out that Al-shabaab has formally joined the Al Qaida network, had lately serous defeats. Ambassador Madeira made mission of the kidnapping at Rabouni, near Tindouf, last October, of three humanitarian agents from Spain and Italy is a source of additional concern to us all. The kidnapping was rejected by AQMI. But MUJAO, a terrorist entity which presents itself as dissident group from AQMI and until recently unknown to many of us, claimed responsibility for this act. Another Islamic group that goes by the name of Ansar Edin has emerged in the Sahel set up by Iyad Agghali, the leader of 1991 Tuareg rebellion. He added that the events in Libya did not just bring weapons of mass destruction and other dangerous weapons of war into the region thus exacerbating the violent activity by the armed groups. They also brought dispossessed and destitute men, women and children, soldiers and mercenaries with proven military skills to place fraught with political instability, institutional weaknesses, abject poverty, growing food crisis, drought, diseases and helplessness. This cocktail is dangerously flammable. It has aggravated the already explosive situation prevailing on the ground and the resurgence of armed conflict in northern Mali may just be one of its immediate consequences. 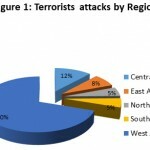 The Sahel Region will, therefore, have to deal with additional terrorist fronts and, consequently, with a likely increase in terrorist and criminal incidents in the region in the near future. With the regard to Nigeria, he said we are witnessing an escalation of activities by Boko Haram with the view to destroying the laic state in this vast country, and replace it with a theocratic Islamic one. After lowering its activities in 2009, the group regained initiative in 2010 and since last year to date it has intensified in an unprecedented manner, its violent actions. Regarding Central Africa, he pointed out the criminal activities of the Lord Resistance Army in DRC, Central African Republic and South Sudan, and those perpetrated by other armed rebel groups against the civilian populations in the sub-region. In the area of collaboration with other International Organizations he underscored the effort that exhorted by the AU, the UN, the EU the USA and the countries affected to combine synergies to root out LRA. Ambassador Madeira said that on the 29th of January, at the initiative of the African Union, Ministers and other senior officials of the countries of the SAHEL region including Nigeria, met in Addis Ababa to discuss common security challenges on the basis of the report and recommendations of the joint AU-UN mission on the impact of the Libyan crisis on the Sahel Region. 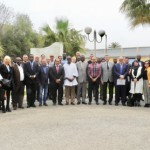 The ministers of the Sahel clearly endorsed the recommendations of the UN-AU report. Recognizing as their responsibility to keep improving governance and try to provide for their people, they pinpointed the need not to separate security from development. They summarized the priority needs for the region in the following way: increased capacity building, continued logistical support and sustained sharing of quality operational intelligence. 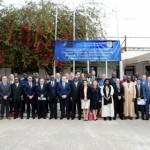 The EU, in its counter terrorism strategy for the Sahel has also identified the need to link and balance security measures and development programs as an absolute requirement. 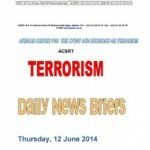 The African Centre for the study and research on terrorism has visited the five regions of our continent and came across a stark coincidence in terms of vulnerabilities of member states and the type of remedy required to curing them. He stressed that the considerable external assistance, financial, material and in terms of long term sustained capacity building are essential to help the vulnerable countries. The Sahel countries have approved a number of documents which, together can be viewed as a regional strategy. ECOWAS also has a more structured and comprehensive draft counter terrorism strategy which already takes into consideration the four pillars of the UN global counter terrorism strategy. The rest of the continent is still lagging behind in this respect. In conclusion, he said, the African centre have identified as priority areas for our intervention at this juncture to galvanize member states’ effort in organizing their counter terrorism institutions, to organize, on a regional basis, training in the areas of intelligence gathering and evaluation, the judiciary and financial intelligence, the protection of critical infrastructures and sensitive sites and the efforts to protect communities and the youth from radicalization. The meetings in COTER are attended by CT focal points in the 27 EU Member States, the Commission, European External Action Service and the EU Counter Terrorism Coordinator Mr. Gilles de Kerchove.